I'm having this Jade plant that I want to turn into a bonsai. It grew a lot in height so I had to prune it to keep it short and thicker the trunk. Now, I was wondering if I make a small cut with a knife somewhere on the trunk (even lower from the arrow below, on the photo) would a new branch grow from it or would it just heal back up and basically seal the cut? I'd really like to grow couple new branches very low in the trunk but I'm not sure how to achieve that. Making a cut might damage the epicormic buds. I would advise you to lightly damage the bark by scratching it in order to remove the thin layer of epidermis and stimulate new shoots. Don't forget that these buds are fragile, so don't apply too much force. The important thing to consider is that epicormic buds are located near the spot when another leaf or branch used to grow, so scratching or cutting in random areas won't result in new shoots. Not the answer you're looking for? Browse other questions tagged pruning bonsai jade branches or ask your own question. 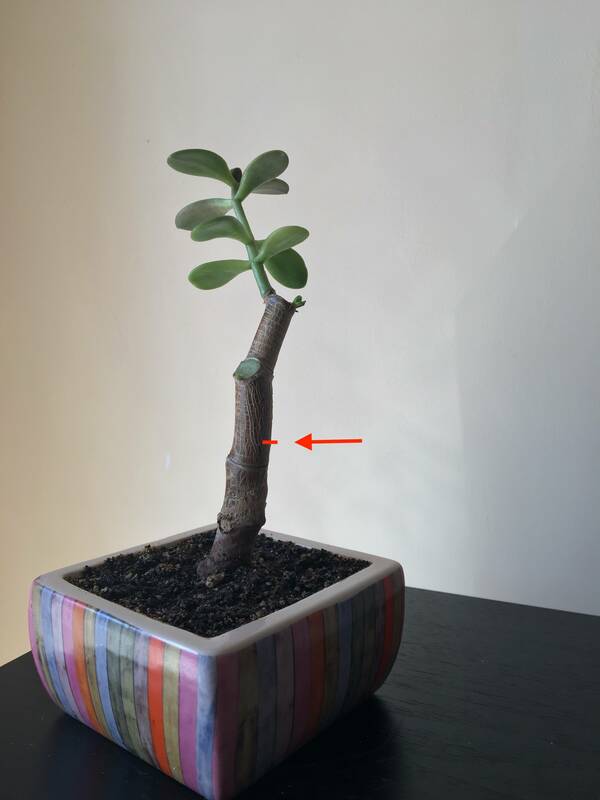 How can I encourage a jade tree to grow a strong trunk? Jade: Can I repot and/or take cuttings? How do I prune an apple tree so it will grow short? Should I Repot a Tall and Spindly Jade Plant? Where should I trim to convert this ash tree in a bonsai? Should I cut off this weak branch on my crepe myrtle or try and support it?